We need a new definition for the kilogram! The present definition (see highlight below) was sanctioned by the first General Conference on Weights and Measures (CGPM, Conférence Général des Poids et Mesures) in 1889, with a minor revision to the words in 1901, and remains unchanged after 116 years. It is the only base unit of the International System of Units (the SI) that is still defined in terms of a prototype artifact, the International Prototype of the Kilogram (IPK), which is kept in a safe at the International Bureau of Weights and Measures (the BIPM, Bureau International des Poids et Mesures) in Sèvres, near Paris. The definitions of the base units play a key role in modern metrology, a subject of ever greater importance in our society. International trade, macro-engineering such as the construction of aircraft wings made in Britain to fit a hull made in France, micro-engineering such as the manufacture of integrated electronic chips with many thousands of elements, the measurement of drug concentrations in medicine, the measurement of pollutants in the environment—all these, and many more, demand reliable measurements to an appropriate level of accuracy for the purpose concerned, and with a known and appropriate uncertainty. In defining the units of the SI upon which this subject is built, we endeavor today to choose definitions that are referenced to quantum properties of atoms or to fundamental constants, a subject known as quantum metrology. Thus, our unit of length (the metre) is defined in terms of the speed of light, and our unit of time (the second) in terms of the period of the hyperfine frequency of a caesium atom. These are believed to be “invariants of nature,” available to anyone, anywhere, at any time, and thus are appropriate references for the internationally agreed units of our system. The present definition of the kilogram in terms of the IPK does not fulfill this requirement, and moreover there are good reasons for believing that the mass of the IPK, along with all its official copies, may be “drifting” in relation to a true invariant such as the mass of a carbon atom, by perhaps as much as 100 μg (0.1 ppm, or a part in 107 ) over 50-year periods. The IPK, a cylinder of platinum-iridium alloy measuring 39 mm high by 39 mm diameter, has been weighed against its various copies three times since it was made: in the 1890s, in the late 1940s, and most recently in the late 1980s. The conclusion from these periodic reviews is that the various kilogram artifacts may well be changing in mass. This is believed to be due to surface contamination (they are stored and weighed in air), wear and tear from handling, and the possible leaching out of gases occluded in the artifact when it was manufactured. We would like a new definition, and we would like one that would fix the kilogram in terms of what we believe to be an invariant of nature, such as a fundamental constant or the mass of an atom. Draft wording for two possible new definitions of the kilogram that have been discussed for the past fifteen years or more are shown below. 6.626 069 311 x 10-34 joule second. (6.022 141 527 x 1023 / 0.012) unbound carbon 12 atoms at rest and in their ground state. It may not be obvious that fixing the value of the Planck constant defines the kilogram: it does so, because h = 6.626... J s = 6.626... kg m2 s-1, and since the metre and the second are already defined in terms of invariants, the value of the kilogram is fixed once the numerical value in this expression is fixed. Similarly m(12C) = (0.012 / 6.022... x 1023) kg, and fixing the numerical value in this expression has the effect of determining the value of the kilogram in the second alternative definition. There are two experiments that are relevant to these two alternative definitions. The first is the watt balance experiment, in which a weight is measured against the electrical force generated by a coil carrying a current suspended in a magnetic field. The electrical measurements are made using the Josephson and quantum hall effects. The second is the X-ray crystal density experiment, in which a perfectly spherical single crystal of silicon (see photo on cover of this issue) is weighed against a kilogram standard, and its lattice spacing is measured by X-ray diffraction, allowing a calculation of the number of atoms in the crystal from its diameter. The watt balance leads to a measurement of the Planck constant h in terms of the kilogram, and the X-ray crystal density experiment leads to a measurement of the Avogadro constant NA in terms of the kilogram. However, if we were to fix the value of h, it would define the kilogram, and the watt balance could then be used to realize the definition. Similarly, if we were to fix the value of NA it would define the kilogram, and the silicon crystal density experiment could be used to realize the definition. Both experiments are complex, and both are expensive and difficult to perform with high accuracy. The present relative uncertainty of measurement in these experiments is about 0.08 ppm for the watt balance experiment, and about 0.4 ppm for the X-ray crystal density experiment. 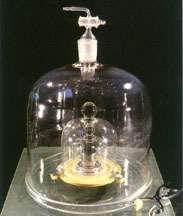 The kilogram, kept by the Bureau International des Poids et Mesures. Either of the two alternatives would give us a definition referenced to an invariant of nature, in place of the somewhat uncertain platinum-iridium prototype used in the present definition. Either could be realized by the experiments described in the previous paragraph, and would also give us a reference available to anyone, anywhere, at anytime, unlike the prototype reference that remains locked in a safe in Sèvres. However, a recent paper by Mills, Mohr, Quinn, Taylor, and Williams, Metrologia 2005, 42, 71–80, has drawn attention to the fact that there are further important considerations involved in changing the definition. All mass measurements are relative. We measure the mass of one object against another. Our ability to make such measurements has improved dramatically in the last 100 years, and even during the last 10 years. To discuss the uncertainties in such experiments we have to consider two distinctly different kinds of mass measurement. On the one hand, we may be concerned with measuring the mass of macroscopic objects, measured in grams or kilograms, usually using a balance of some kind. This, to most of us, is the kind of mass measurement that immediately springs to mind; we might call it “macroscopic mass metrology.” The reference standard for such measurements is (at present) the prototype kilogram—the IPK—used in the current definition of the kilogram. The IPK has proved a convenient reference for making macroscopic mass measurements, and even if we change the definition to one of the alternatives, it is likely to remain an important intermediate step in relating mass standards around the world for macroscopic mass measurements. On the other hand, physicists and chemists are concerned with the masses of atoms and fundamental particles, which may be compared with each other by mass spectrometry, for example. The reference standard for these measurements is the unified atomic mass unit, symbol u, defined as one-twelfth of the mass of a carbon 12 atom, also known as the atomic mass constant mu. * We might call such measurements “microscopic mass metrology.” It is also a fact that the best estimates of the values of many of the fundamental constants of physics, such as the Planck constant h and the elementary charge e are strongly correlated with the atomic masses, so that whenever we discuss the masses of the atoms we have also to consider the values of the fundamental constants. The present situation is that relative mass measurements within either the field of macroscopic or microscopic masses can be made with very much higher precision than that with which we are able to compare masses between the two fields. For example, it is possible to compare the mass of two kilogram artifacts, using the best modern balances, to better than a part in 109, a relative uncertainty of less than 0.001 ppm, or less than a microgram in a kilogram. Similarly, the mass of an electron me can be determined relative to the unified atomic mass constant mu with a relative uncertainty of 4.4 parts in 1010, 0.00044 ppm. However, when it comes to measuring the mass of any of the fundamental particles in terms of the present SI kilogram, the uncertainty is about 2 parts in 107, 0.2 ppm, a relative uncertainty more than two orders of magnitude greater. Such measurements are dependent on either the watt balance or the silicon crystal density experiment. The present uncertainty in our best measurement of me/kg, for example, is 0.17 ppm, and there is a similar uncertainty in all atomic and particle masses when they are expressed in the present SI kilogram. 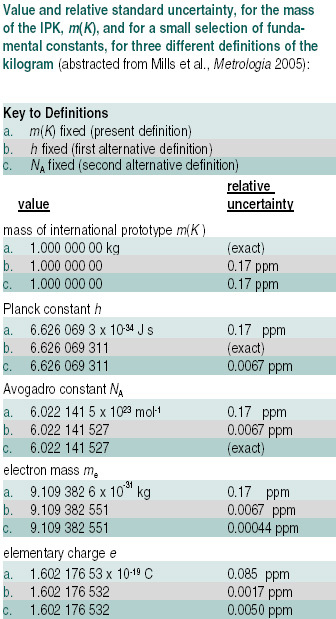 Moreover, most of the fundamental constants of physics depend on the kilogram (see table above). The best estimates of these constants are revised at intervals by the CODATA (Committee on Data for Science and Technology) task group established for this purpose. The most recent 2002 revision was published earlier this year (Mohr and Taylor, Rev. Mod. Phys. 2005, 77, 1–107). This review shows that the present relative uncertainties in the fundamental constants, when expressed in SI units, are mostly around 0.2 ppm. In every case the dominant contribution to this uncertainty is simply the uncertainty in relating atomic or particle masses to the macroscopic reference kilogram, the IPK. The present situation regarding redefining the kilogram is, therefore, as follows. If we were to change to a new definition using a fundamental constant or an atomic mass as a reference, it would follow immediately that all particle masses and fundamental constants would be known with an uncertainty reduced by two orders of magnitude—because their values expressed in SI units would no longer involve a knowledge of the bridge between macroscopic and microscopic masses. Both the elementary charge e and the Josephson constant KJ would also be more accurately known by a similar factor, so that all electrical measurements made using these constants would be similarly improved. These are important advantages. The effect on the values of the fundamental constants is illustrated in the table on page 15. However, the mass of the IPK would no longer be 1 kg by definition, but would have to be determined by experiment. Although the constant appearing in the new definition would be chosen so that the mass of the prototype would initially still be exactly 1 kg, it would be subject to the uncertainty of about 0.2 ppm that applies to all atomic masses under the present definition, and it is also possible that future measurements would lead us to revise the mass of the IPK so that it might be slightly different from 1 kg. Although it is unlikely that this change would ever be greater than 0.2 ppm, this is seen as a disadvantage of changing the definition by those concerned with macroscopic mass metrology. Mills et al. suggest that, after changing the definition, macroscopic mass measurements could continue to be made in terms of the mass of the IPK, with a correction factor being applied in those rare occasions when it is really necessary. If, however, we retain the present definition, then the values of the fundamental constants expressed in SI units will remain uncertain to about 0.2 ppm, just as they are at present. The mass of the IPK will remain equal to 1 kg by definition—although this would not dispel doubts arising from the uncertainty of the mass of the IPK compared to an invariant of nature. The magnitude of this uncertainty is not known, but it is believed to be of the order 0.05 ppm, or possibly as much as 0.1 ppm. There is little doubt that the definition of the kilogram will eventually be changed to one of the two alternatives . . . In this brief review it is not possible to cover all the problems of redefining the kilogram, and readers are referred to the paper by Mills et al. for further details. However, there is one further point to note here, which concerns the timing of any possible change. Changes to the base units of the SI are made by the CGPM, on the advice of the CIPM (International Committee for Weights and Measures) and its various consultative committees. The CGPM meets at four-year intervals, and the next two meetings will be in October 2007 and in October 2011. There is little doubt that the definition of the kilogram will eventually be changed to one of the two alternatives, but there are different opinions about when to make the change. The argument for making the change as soon as possible is that once we change to one of the proposed alternative definitions, we shall know the values of the fundamental constants with much reduced uncertainty, and, moreover, future CODATA reviews can only lead to zero or very small changes in their values. We shall also be using a kilogram defined by reference to an invariant of nature. This has to be set against the fact that improved watt balance results in a few year’s time might perhaps lead to small changes in our estimate of the mass of the IPK, which will almost certainly continue to be used as an intermediate reference standard in macroscopic mass measurements. But such changes are unlikely to be greater than the believed uncertainty arising from the drift in the mass of the IPK compared to a true invariant. On the other hand, the possible advantage in postponing the change is that new watt balance results in the next few years cannot lead to any change in the mass of the IPK, which will always be 1 kg by definition, although, of course, doubts about the drift of its true mass will remain. However, we would lack the advantage of lower uncertainties in the fundamental constants, and new watt balance measurements might lead to significant changes in the fundamental constants in future CODATA reviews. This would be an inconvenience to atomic and molecular physicists, and to electrical metrologists who make use of the Josephson constant and the elementary charge. The choice is between redefining the kilogram now—so that it is referenced to an invariant of nature, and the fundamental constants are more exactly known and will not be subject to significant future changes—or postponing the decision until new experiments have reduced the uncertainty in the relation between the atomic masses and the IPK to some chosen value, perhaps 2 or 3 parts in 108, and putting up with the disadvantages in the meantime. In writing this short article, I have tried to present the various arguments objectively, without taking sides. However, I must conclude by saying that I personally find the arguments for making the change as soon as possible to be compelling. I would also prefer the new definition chosen to fix h rather than NA, although the difference is small, because of the central place that the Planck constant has as the fundamental constant of quantum physics. *This unit is also known as the dalton, symbol Da. The latter name and symbol is widely used by biochemists and others concerned with the mass of large molecules that may be measured in kilodaltons, kDa, or megadaltons, MDa. Thus 1 Da = 1u = mu = m(12C) / 12. Ian Mills <i.m.mills@reading.ac.uk> has been the IUPAC Representative on BIMP since 1996. He is a professor at the University of Reading.